Due to the nasty weather here in the northwest work was slow and I was home. I was happy to have a little more time this winter to spend with my family and feed the wood stove. But today they were at work or school and it was raining cats and dogs so I scurried around to gather my gear and head down to the river to try to catch a big Brown. I was stoked after watching a video about some young guys in Oregon who fished for trophy Browns with what looked to be large marabou streamers. But I like the idea of wooly buggers better because they cast real easy like, which is my preference. So I did an internet search to see if I could catch Trophy Browns with a wooly bugger. Most of the trophy Browns I have caught were neither Trophies or Browns and were not caught with streamers. The authorities on big Brown stalking were pretty much in agreement. Yes, wooly buggers work, but only if your string like, a half a dozen of them together. 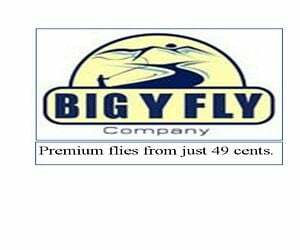 You cant use a little fly for huge fish it seems. Fine. I hate big flies. They cast like crap. I searched my fly boxes and found a big rabbit streamer that could have used a few extra inches but would have to do the trick. It was the second biggest one in my box next to the huge helmet headed Bull trout fly that I simply could not use because it was just too heavy for the waters I wanted to fish. After about two hours of rummaging through the organized mess in my bedroom and shop. (Me: Honey, have you seen my, uh,….uh” Honey: “Brain?”) I was wadered up and in the car, headed to my favorite tailout. My rod was laced up complete with the rabbit strip streamer and stashed in the passenger seat. When I parked I realized I had left my chest pack back home in the garage. It contained my fly box with the best selection of large Brown streamers I could scrounge together. I was already miffed because for the first time in a long time someone else was parked at the trailhead. That, and the sun was out. Perfect. Everything was backwards. I wanted snotty, dark weather. Had I been on my way to cast long belly Spey lines on a nice day the wind would have kicked up as soon as I stepped in the water and would not have laid back down until I forced myself through the motions to prove to the wind I was serious. Then it would die and I could get on with casting or the wind would retaliate and blow me off the water. Stupid wind. But not today. My perfect stripping for trophy Browns day was turning into a stinking bluebird day. And, I had one fly, and somebody was fishing my hole. I proceeded to the river in a huff. As is my custom I became disoriented and had to scale a rock cliff to get to my spot. Besides the cliff I had talked myself down from being in a really cranky mood using professional level self help style fisherman talk. The guy’s probably not even fishing your spot, I told myself. By the time you get to the water the sun will go behind a cloud. You know how quick the weather changes around here. You’re only going to high-grade the sweet-spots and be done in less than an hour. One fly is plenty. I told myself all of those things. Silently and in a loud voice. So I chilled out and slowed down and decided to enjoy myself. I was happy to get away from this blog and this internet learning curve I was putting myself through in order to educate my way into the world of modern technology . I needed to go flail some water and be a person again. I leaned my rod against a tree, removed my backpack and enjoyed the view from the precipice I was descending, long enough to take a breather. Somewhat revived, I found a game trail with my tracks in it from last week and made my way down to the water. The water was low. Not to be too picky or get all negative again but I kinda needed the water to be high. When I arrived to my spot I saw the man fishing there. Not that he was actually fishing my spot, but he was wading in the spot I needed to cross to get to my spot. I needed to be wading in his spot. No problem. I would walk upstream and cross the river well above him and fish the opposite bank. I’ll just put my phone in my backpack so when I fall in it will be protected I told myself. It is hard to put your phone in your backpack when your backpack is up on top of the cliff where you took your last breather. I kept a cool head because a lot of money was involved here. I had a reel and several lines and miscellaneous paraphernalia in that pack. It was a red backpack that I stole from my kid. I don’t use camo backpacks for fishing because when you lose them they blend into the sagebrush and you cant find them. So I have a red backpack that will be easy to find when I lose it. My friend Richard lost his backpack with all of his goods including his camera on the lower Deschutes a few years ago and never found it. Poor planning on his part. Always use a fluorescent backpack. I scaled back up the cliff and miraculously found my pack. Disaster averted. My luck was not exactly changing but at least I was getting closer to breaking even. I walked back down to the river and came to my senses after I petered out on two different river crossings. The river crossings I told myself, weren’t worth it. So I walked down to my spot and the man was gone. I hoped he hadn’t downed. I looked around just in case because nothing can boost your blog ratings like saving a drowning victim and posting it on your site. I had also hoped while scaling the cliff that I would be attacked by a cougar and capture my experience on my phone. With my luck my phone battery would die, just as I was about to fend off the big cat with my Beulah. The sun was now off the water due to a thin cloud as I waded next to the honey hole that held a brown the size of my leg. I dead drifted my streamer through the sweet spot on the far side and after half a dozen casts the sun peeked out from behind a cloud, shining bright on the water. I sighed, loud, in disgust. It was the kind of sigh you make before you break your rod over your knee and throw it in the bucket. Kerwham. He hit. He was heavy. We grappled. He came unpinned. I re-booted and I stripped my fly through the lower end of the pool and lost another one. Any normal person could have understandably been a little perturbed, but I wasn’t mad anymore. I had finally arrived at and enjoyed my own little stretch of good luck. I missed my opportunity but I had a chance and I guess I was satisfied with that. It’s too bad I couldn’t have savored the day more because it turned out sweet in spite of myself and my attitude. Next time out I’ll have an entire box of flies about ten inches long. I’ll be uber organized. I’ll leave early and be on the water before the sun hits. I’ll also remember that that there is no such thing as the worst day fishing. Thank you Greg. Unfortunately, I think we can all relate to mishaps every bit as much as landing fish. Sometimes it makes for a better story anyway. Great to have your comments here. Thanks again! “I’m not entirely useless, I can always serve as a bad example”…Just kidding, that is greatly entertaining, in large part because it is real.